The concept is taken from the Greek word "stigma" and means "sign, brandmark", in the strict sense "pierce or stab". Theologically speaking, it circumscribes the stigmatisation to be a spontaneous appearance of the scars Jesus has suffered in his Passion (Stigmata), seen on the body of a living person, especially on hands, feet, around the heart, head, shoulders and back. Psychology sees it to be a mentally conditioned effect, Theology, to be a charismatic sign, and the Sciences have no explanation at all until now. The wounds (Stigmata) stay without festering or infection, can not be treated medically, often remain open and bleed on certain days, usually on Fridays, the day of the Passion of Jesus. The first historically verified stigmatisation is attributed to Franz of Assisi; he lived in the 13th Century. Until the death of the Franciscan Fr. Pio von Pietrelcina, Italy, in 1968, more than 300 instances of stigmatisation are known. Therese Neumann's stigmatisation started on March 4, 1926, first with a wound near her heart (see chapter Biography). 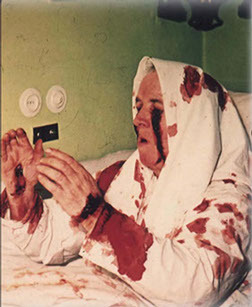 In the following Friday-sufferings during Lent 1926, not only the range of her vision enlarged, but with each suffering more bleeding Stigmata appeared. Pastor Joseph Naber from Konnersreuth reported about Therese's condition on Good Friday 1926: " When I, together with another Priest, visited her [Therese] on Good Friday after lunch, [we] found her lying in great torture, the eyes clogged with blood, two streamlets of blood running down her cheeks, pale like a dying person. Until 3 o'clock, the Hour of Death of the Saviour, she struggled in terrible agony of death. ... During this death agony on Good Friday, she had viewed all the sufferings of the Saviour, beginning on the Mount of Olives down to Calvary, and had shared it in a very intense way, even his abandonment on the Cross. At that time, she had felt severe pain on the upper side of her hands and feet. Now, both hands and feet show kind of round, open wounds, out of them runs pure blood. Already several weeks before Easter, suddenly a longish wound broke open in the area of her heart. At times, a lot of pure blood came out of this wound. The Medical Doctor had scrutinized all these wounds" (Gerlich, p. 114, Waldsassener Grenzzeitung, April 21, 1926).